The new era of decentralization has spawned a massive range of interesting new ideas that use blockchain in clever ways. Some seek to improve on current products or processes, others have created entirely new concepts which didn’t exist before blockchain. This has lead to the rise of decentralized applications (dapps / Dapps / dApps / DApps) which are experimenting in many areas, from currency exchanges to gaming to virtual collecting. Here at Verity, as proponents of blockchain working on building a decentralized oracle for smart contracts — we have created a list of our personal favourite dapps and decentralized projects. Try them out and let us know what you think in the comments. Created by one man wanting to ‘beat the bookies at their own game’, 0xgame demonstrates the benefits of blockchain by eliminating the middleman, in this case, the bookmaker. Requiring no registration and charging no fees, the site offers pool (parimutuel) betting on various sports (football, basketball, hockey etc), eSports (DOTA, LOL, CS:GO), as well as other events — such as elections. The non-profit site takes no edge, hence often offers better odds than the big betting platforms. Think of it as betting with your friends down the bar; you trust them, and the winners take all. Other benefits of this blockchain-powered betting experiment are that it has no fees, and instant withdrawals. As well as eliminating the need for a central bookmaker, the decentralization community will love that fact that 0xgame is unlinked to any central source, meaning it truly is an independent operation; from the smart contracts that ensure the payouts, to the sports data which is sourced from Verity’s decentralized oracle, this truly is a potential betting industry disrupter. Definitely one to check out if you want to see the benefits of blockchain for the betting world. This virtual-cat-collectible project deserves a place in our best Dapps list for bringing crypto to the crowds. Cats have long been internet favorites, so it was only a matter of time before someone tokenized them and put then on the ethereum blockchain. Kitty collectors can purchase and breed the digital felines, then resell them. It was late 2017 when these cyber-felines came to be, and they generated so much interest that they slowed the entire ethereum network and sent gas fees sky high. That may have enraged the more serious crypto-fans but it also brought blockchain literacy to a whole new audience. The crypto-kitty community continues to exist, with rare breeds selling for thousands of dollars. 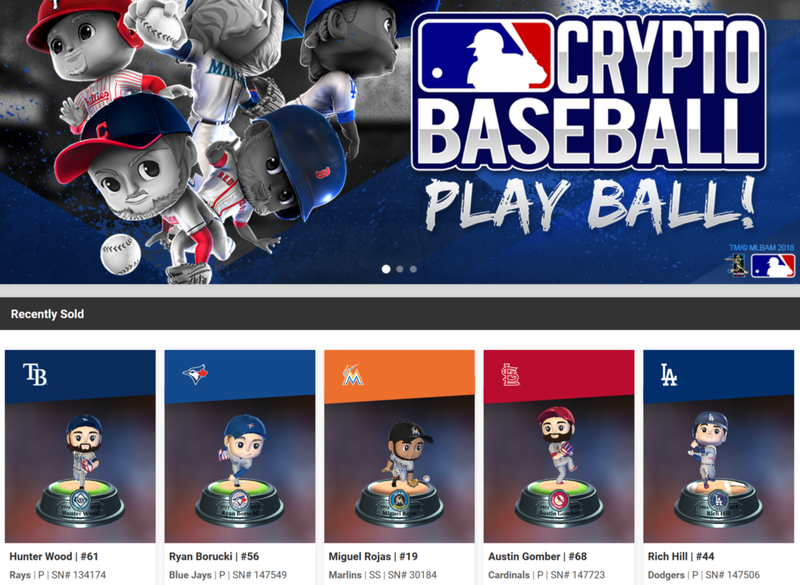 MLB Crypto Baseball — swing crypto batter, swing! Taking the long-enjoyed concept of fantasy league sports, MLB Crypto Baseball put fantasy league baseball on blockchain. You purchase virtual model players and the better your players perform in real life, the higher their value and the more they are worth. You can then buy and sell your players in the Crypto Baseball marketplace. Another great example of utilizing blockchain this time to decentralize any organisation. 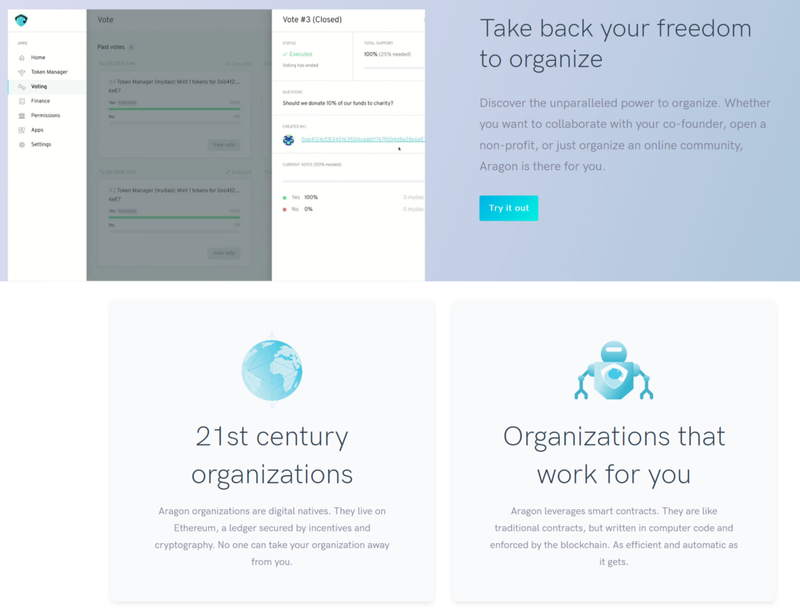 The Aragon concept allows you to build a decentralized company or community, allowing you to assign votes to certain contract addresses which can later vote on decisions, spend assigned money, and connect different apps to your organisation. Is this the future of collaboration? Another excellent example of using smart contracts to cut out the middleman and create transparency. Built by a developer with 15 years experience in corporate development, he took the idea from SatoshiDice, and ported it over to the Ethereum blockchain. 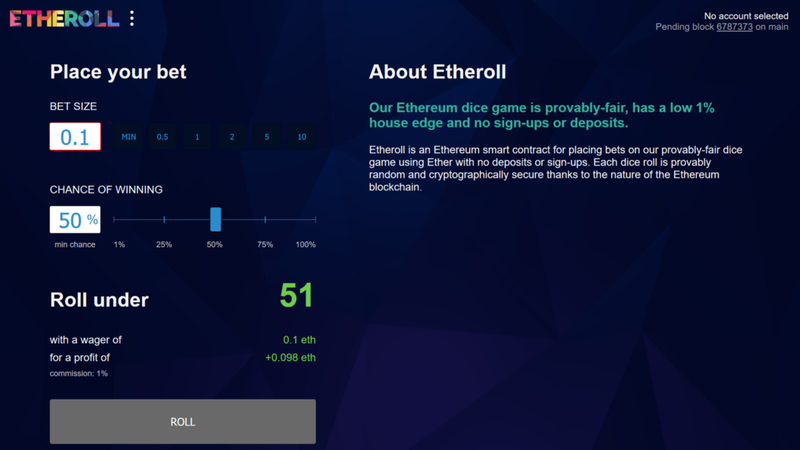 Like 0xgame, Etheroll takes advantage of smart contracts to remove the house, making it possible to place bets on provably fair dice games, with no deposits or sign-ups required. Unlike 0xgame, Etheroll does take a cut of the betting pot, but at 1% house edge, it’s much lower than most casinos. Etheroll has spawned numerous copycat sites, although of course ‘shooting dice’ itself long predates blockchain. 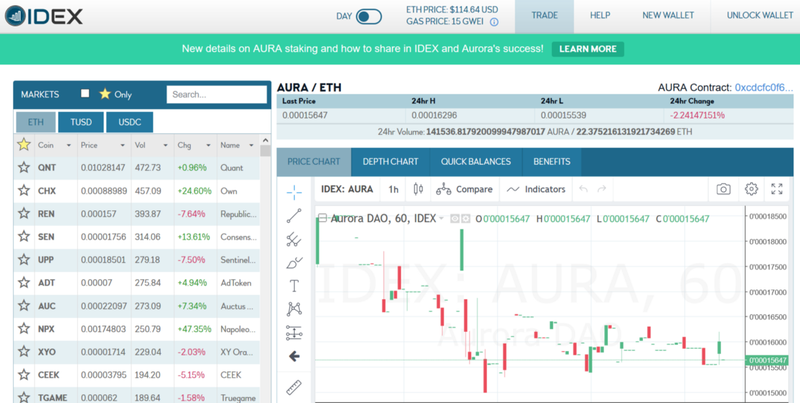 Most in the world of crypto trading will have heard of, if not used, IDEX at some point. Whether it’s a true Dapp is debatable as they have a centralized order book so are perhaps more of a hybrid than pure Dapp. However they are a much used website by some of our team and, according to DappRadar, the most used Dapp that currently exists. We couldn’t do an article about Dapps without mentioning the ‘house of Dapps’: DappRadar. It’s not a Dapp itself, but using the open source nature of blockchains, it has created a place that collects Dapp data and allows you to see which ones are trending up and down, based on the number of users and volume of ETH (or EOS, or TRON). Splitting Dapps into various categories, such as gaming, gambling and collectibles, it’s a great place to discover new Dapps and try out the ones which are growing in popularity. StateOfTheDapps and Dapp.com are similar concepts and well worth a look too. Do you agree with our favorite Dapps list? Let us know in the comments below.